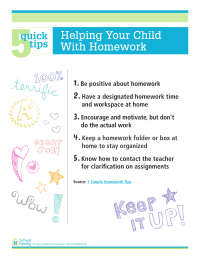 Take the hassle out of homework time with this printable sheet of 5 quick homework helps. As a parent, you want your kids to get good grades. But you also want them to be happy, to have friends, and to enjoy going to school each day. 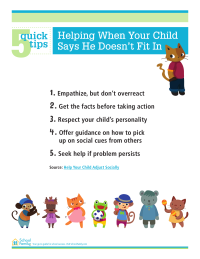 Here are 5 quick tips to help your child adjust socially. 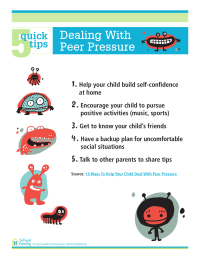 Peer pressure begins when children are young—and increases as they grow older. Use this printable sheet of 5 quick tips to help your child make good decisions. Parents can print these eight-to-a-sheet school bus-theme name badges for back-to-school peace of mind. 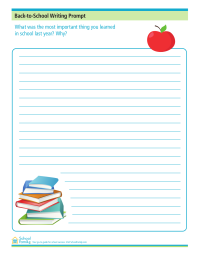 Use this writing prompt to help practice their writing skills while helping them get enthused about returning to school by thinking about the most important lesson they learned.